In an effort to get Facebook friends to meet face-to-face, the social media network has launched Nearby Friends. This new location feature allows friends to broadcast their physical distance from each other, and to each other, so they can get together in life instead of only online. TechCrunch.com reported on how the new feature strikes a friendly balance between proximity and privacy. Nearby Friends will be rolling out to users over the next few weeks as a way to promote the personal value of connecting offline. Facebook has wisely decided to make this an opt-in feature to give users control over meeting up with friends or maintaining their physical privacy. The feature makes connecting more convenient by allowing users to find select friends nearby. 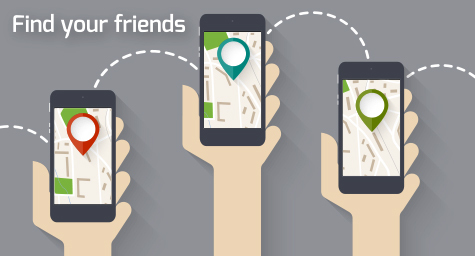 When a user opts in and activates Nearby Friends, it displays the user’s physical distance away from their select group of friends and shows a feed of those select friends in the surrounding area. Along with measuring in miles, it also shows distance in time to allow users to schedule select times to meet their select friends. Clearly, the emphasis is on “select” because the feature gives users complete control over which friends can view their location. Users may be making their whereabouts public, but it’s on their personal terms and with people they personally choose. Nearby Friends is simple to use and even easier to activate by switching it either on or off. Once it’s off, the user is immediately “off the grid” and it stops broadcasting their location and proximity. It’s important to note that the feature must be turned off manually by the user or it will continue to display their location to friends. Users can also delete their location histories, which are usually stored on the network’s servers, to remove any trace or trackable record of their previous whereabouts. This is another prime privacy measure designed to protect users. With Nearby Friends, Facebook is striving to bring personal connection back to digital connections. With today’s focus on privacy in social media, Facebook has taken every precaution to make Nearby Friends respect the user’s desire for privacy while offering the option of convenient connection for online friends in the offline world. According to Mashable.com, Facebook plans to promote the benefits of opting-in to Nearby Friends in the News Feed as the feature is rolled out in the coming weeks. Facebook will probably position it as a simple way to share real time instead of just “real-time” with Facebook friends, yet without sharing anything private with anyone outside of their personal circles. Altogether, it’s the perk of proximity with the preference and protection of privacy. If the promise and premise of proximity is successful with users, it will interesting to see if Facebook can leverage these location-based connections to help advertisers build better connections with consumers. Keep up with the latest in social media. Contact MDG Advertising today at 561-338-7797, or visit mdgadvertising.com. MDG Advertising, a full-service advertising agency with offices in Boca Raton and New York, NY, is one of Florida’s top branding firms. MDG’s capabilities include print advertising, direct mail marketing, branding, logo design, creative, digital marketing, media buying and planning, radio and TV advertising, Web design and development, online video advertising, infographic development, email marketing, content marketing, social media marketing, and SEO. For the latest trends in advertising and branding, contact MDG Advertising today at 561-338-7797 or visit mdgadvertising.com.